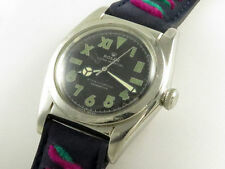 Vintage gents Rolex Tudor Oysterslim, rare hand wind watch. working. The watch is hand winding and working. Cannot remove back case as i don't have the right size tool. Back case reads Rolex Geneva Original Oyster. Condition is original used condition with scratches to face and marks to case all as found. THE WATCH DATES TO 1969 AND IS HALLMARKED ON THE INSIDE OF THE BACK CASE. THE INSIDE OF THE BACK CASE HAS THE ROLEX LOGO AND THE TUDOR SERIAL NUMBER 31273 FOR 1969. THERE IS ALSO A SUB SECOND DIAL. Iconic Rolex Oyster Royal Precision 6426 with champagne dial and stainless bracelet. MODEL : Oyster Royal Precision, 6426. due to its rarity this is one not to miss. CONDITION : Pre-owned with history. New listingRolex Submariner Men's Automatic Watch - Black Dial. 5 out of 5 stars - Rolex Submariner Men's Automatic Watch - Black Dial. 3 product ratings3 product ratings - Rolex Submariner Men's Automatic Watch - Black Dial. 9ct fully hallmarked case dating 1939 and stamped ‘Dennison – Made in England for Rolex’. Watch is running. Generic tan leather strap with generic gold plated buckle. Dial in very good condition for age. 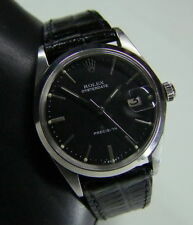 Relisted due to time waster- Gents Rolex Oyster Perpetual Date 1500 Automatic S.Steel Blue Dial . Condition is Used. Dispatched with Royal Mail 1st Class or local delivery/collection. Watch feature beautiful blue dial that really catches the light as well as gold doorstep hour markers and hand which is very rare for this model. Scratch to the face but is to be expected with a watch of this age Please feel free to send any questions you may have. Used rolex gents watch 1964 oysterdate precision in good working order and condition .serviced November last year with new crown and tube fitted .free UK p&p recorded .bids only please no reserve .good luck . The watch is a 36mm silver case with an engine turned bezel. It has silver Rolex jubilee bracelet and the face has silver baton markings. The watch is in great condition as you can see from the photos the only minor imperfection is a indentation on the clasp as seen on the photograph and very minor signs of wear and tear to be expected from a watch that is over 40 years old. Hi you are looking at a beautifulRolex Oyster Precision 6427 handwing watch in good condition. The case reference is 6427. It has an original crown with the Rolex logo but there is no screw in the watch case. Bracelet is not gold. advertised in other places. Tudor Rolex Oyster Stainless Steel Silver Dial Gents Vintage Wrist Watch. Condition is Used. Dispatched with Royal Mail 2nd Class. men's watches. Sent with Australia Post Pre-Paid Parcel Post Satchel 500g. Hi you are looking at a beautifulRolex Oysterdate Precision 6466 handwing watch in good condition. The case reference is 6466. It has an original crown with the Rolex logo. The watch has 17 jewels. AFTER BEING MESSED AROUND THREE TIMES BY COMPLETE MUPPETS I HAVE TO RELIST AGAIN!!! IF YOU CANT PAY ...... DONT BID!! Genuine Rolex Oyster Royal Men's watch. c1963 Will be sent via MyHermes Insured and Tracked Courier service. ANY questions please ask. I've owned this for about 20 years, its just sat in a draw now!! Pictures were taken today 4/3/19 FOR ALL THE EINSTIENS and Pocket Detectives out there ….. NO it's NOT the Original Box from 1963, when this watch was made!! INSPECTION WELCOMED. This has been checked and Certified by my Insurance Company as a 100% GENUINE watch!! SCAMMERS BEWARE! Rolex Sea-Dweller Oyster Perpetual Submariner . Condition is Used. Dispatched with Royal Mail 1st Class Large Letter. This watch was given to me by my father, it's just been gathering dust in my room as I'm not a watch person. I thought that someone else would appreciate and wear it more than it being stuck in it's box. I'm not sure how much this sort of watch will go for but I gather that the brand Rolex has a lot of authority so I hope I will receive a fair price for the item. Any question message me, thanks. SUPERB AUTHENTIC GENTS 18K GOLD AND STAINLESS STEEL 1974 ROLEX OYSTER PERPETUAL DATE WATCH. THE BEZEL AND CROWN ARE IN SOLID 18K GOLD. THE ROLEX LOGO IS ON THE DIAL, SCREW DOWN CROWN AND BUCKLE. THE SERIAL NUMBER BETWEEN THE LUGS IS 3111361. O RIGINAL 18k SOLID GOLD ROLEX STRAP BUCKLE. I WILL ALSO INCLUDE AN AUTHENTIC ROLEX SERVICE BOX AND POUCH. SIZE 32mm EXCLUDING CROWN. CALIBRE 1601 20 JEWELS SWISS MADE. SOLID 18k GOLD. In well used condition with signs of wear to the 9ct Gold ALD Dennison case which has initials engraved to the case-back. Case says"Made in England for Rolex " so it just shows we once manufactured watch cases for the Swiss!! 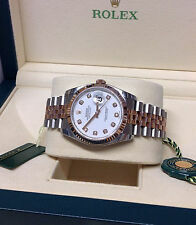 Gents Rolex Watch Automatic Oyster Perpertual Date. Grey Dial. 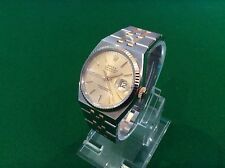 Gents Rolex Watch Automatic Oyster Perpertual Date. Grey dial Rolex date. Metal strap. No box or papers. Generally the watch is in good condition, there are some light scratches from wear. Working and Keeping good time. I am not 100% but the Watch is circa 1970’s. Please see photos to help with description and condition. I have dated this stunning Rolex Tudor to 1984 using the serial numbers (64,318 between the lugs). Fully serviced! It's a real pleasure to see such a fantastic one. This is the original Untouched Dial that left the Rolex factory in 1984. The watch has been taken to a Prestige Rolex Dealer for verification and information and despite its faults, they described it as in pretty good condition. The watch is working fine and the second hand moves as it should, the original perspex glass has a crack as pictured and the winder is stuck and doesn't move the hands, it is certainly in need of a good clean. The wristwatch is in good condition. This is an easy job for a professional watchmaker. Year: 1916. Also, it has a slight crack between 4 and 1. Other than those issues, it is looking nice and it still has the fluorescent substance on part of the hours. Featuring a silver dial with silver batons, this is the 15200 model. This pre owned Rolex Date Oyster Perpetual stainless steel wristwatch dates from circa 1987 and is in overall excellent condition with light scratches to the case and bracelet. Rolex DateJust 16234 Stainless Steel. Stainless steel case with fluted bezel. Stainless steel jubilee bracelet. Watch is running. Case and bracelet in good condition – minor surface scratches. Year: 2001 (K serial number). Rolex Tudor Oyster Prince Day-date 94613. Rolex Submariner 16613 Steel&18ct. Stainless steel case with 18ct yellow gold uni-directional bezel with blue detailing. Modern Rolex Box only. Watch is running. Blue dial with luminescent hour markers and date function. Original dial hands in fair condition. Case still retains most of its original detail. Featuring a black dial with gold batons, this is the classic 6694 model. AgeCirca 1971. CaseStainless steel. BraceletStainless steel. Glass ConditionVery good with scratches. Dial ConditionExcellent with minor marks. The outer case is stamped 869/48503. We have been established for over 50 years, and are one of the largest Jewellers in the UK. As new condition as just been serviced by Rolex and not worn since. Solid 9ct 375 gold case with Rolex crown on the press back case again in super original condition we have had the watch very lightly polished. solid 9ct yellow gold. Rolex Precision. Financial Conduct Authority. SeriesOyster Perpetual. CaseStainless steel and Gold. BraceletStainless steel and gold. DialGold, gold batons. Dial ConditionExcellent with minor marks. Bracelet ConditionVery good with light scratches and stretch. * RESERVE OFF ! * START $ 1 ** RESERVE OFF! LADY WATCH! Rolex men's watches are classic designer timepieces that are designed for statement accessorising. These watches add a dash of luxury to any outfit. Solid gold Rolex watches are available in a wide variety of styles and designs. These vintage, retro and modern watches are made from solid 9K and 18K yellow gold and typically boast a solid round case, fixed bezel and iconic trademark logo. The dial style and clock hands vary according to design style. Some gold watches have a solid gold link bracelet strap, while other styles feature a premium leather wrist strap. Stainless steel is a popular option for precision designer Rolex men's watches. The chunky, oversized watches often show off coloured round dials that are accentuated by the brushed or polished metal bezel, distinctive time markers and hands, and the link bracelet strap. Chic gold plated Rolex men's watches traditionally flaunt vintage and retro good looks. Some styles feature curved Bombay lugs with an oyster silver dial and a mechanical hand winder. Fluted bezel Rolex men's watches are also a popular retro fashion statement. Modern Rolex men's chronograph watches detail traditionally display two or three subsidiary dials with an optional date window. These classic designer Rolex men's watches also show off marker settings on the bezel and unusual clock hands. Formal and dress style Rolex men's watches typically have vintage and retro design appeal. The classic oyster perpetual watches often have a round coloured dial with slim time markers, curved lugs and a textured genuine black leather strap. Some styles also feature a date window set at 3.00. Retro Rolex men's watches often display a stylish square or rectangular dial and fixed bezel. Rare vintage Rolex watches have Arabic numerals decorating the dial, and a leather strap with buckle fastening. Classic Rolex men's watches are typically characterised by the unusual subsidiary dials that display time intervals. The sporty, oversized designs are usually made from stainless steel. Vintage Rolex men's chronograph watches have a high quality leather strap with standard buckle fastening. Traditional Rolex men's watches that feature decorative bezel detailing are modelled on classic military and aviation instrumentation. Solid gold Rolex men's watches are normally embellished with a decorative solid gold link bracelet. Some styles have a leather strap instead. Stainless steel Rolex straps are a popular design choice for most styles of this luxury men's watch. Genuine leather straps give the classic Rolex men's watches an authentic vintage style.